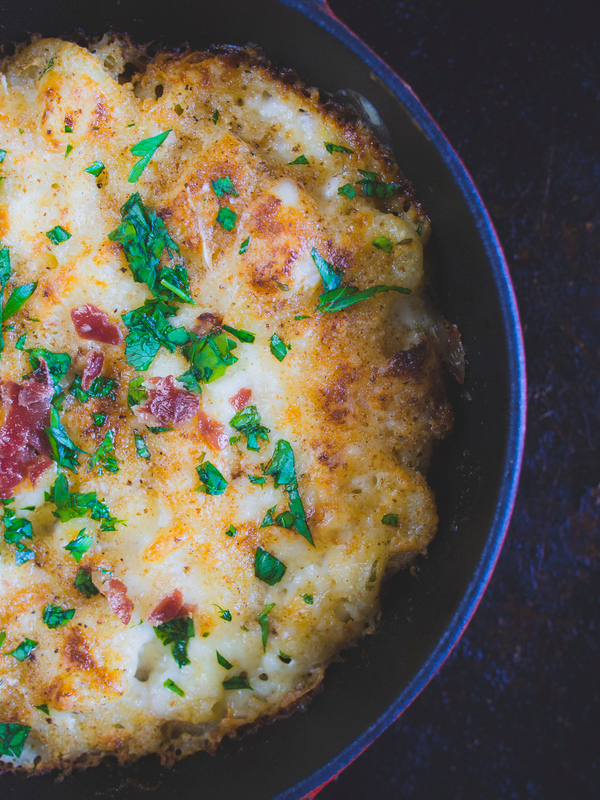 This recipe for black truffle mac and cheese is indulgent. It’s also special to me because I created it for a night I had two great friends over for dinner. We met when I first moved to Toronto and worked in advertising. I had moved from small town Nova Scotia to the big city and I was on my own. It seems like a million years ago but it was just a decade. We were all young, broke and having a great time in Toronto. Our careers meant we worked long hours for little pay with the unspoken promise of much more if we could make it through the rookie years. We did survive and now we have faint memories of nights out doing foolish things and sharing secrets we’d never want anyone else to know. But the recent years have been much different. Six years ago I sold off all possessions and bought a one-way ticket to Mexico. My industry family also moved on – they got married, bought houses and had children. When I finally did settle down after meeting Dave, it didn’t bring order. We ran Loka Snacks, a pop-up restaurant in the back of a bar and then we opened Loka, a bricks and mortar restaurant exploring Canadian cuisine. You’ll never see your friends unless they work in one too. It’s not that you don’t care but you have opposite schedules. They work 9-5. You work 5-12. They get weekends and holidays off. Those are my busiest times of the week. Also, they have kids so they can’t just drop everything if you get off early. Parents can’t just drop everything and go for a drink at 10pm like they did in their 20s. Once we opened Loka, none of my friends saw me unless they came to the restaurant to eat. However, once we reached our one-year mark I stepped back from Loka. We have great staff and it didn’t need me to be there. And so, I’ve been trying to reassemble former parts of my life that I still care about. Having friends over for dinner was most important to me. We can catch up, eat great food, drink wine and not have to worry if we’re sitting at the table too long. When we were poor advertising coordinators I had them over for dinner because we had no money, now I do it because I care about them and the easiest way to show that is through food. I like to serve easy dishes that people will love. I hate going to someone’s house and they’ve made something so elaborate that they spend most of the time in the kitchen while everyone else is having a great time. It’s not about perfect food. It’s about spending time with people you care about, the friends who have become part of your family. Pasta is great for this, in fact the last time I had these two over I introduced them to butternut squash pasta. Black truffle mac and cheese is comforting and indulgent and the decadence of the black truffle oil makes it special for friends. 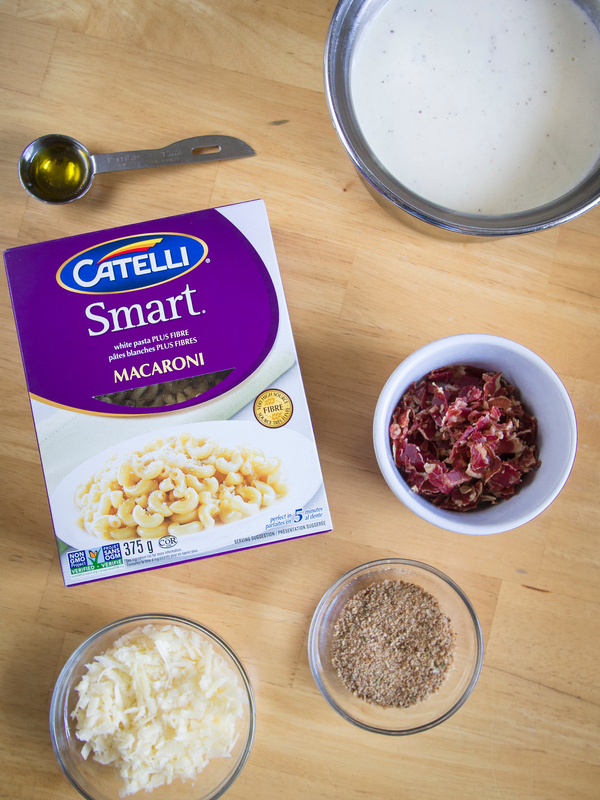 To plus up the healthiness, I’ve used Catelli Smart Veggie Macaroni which incorporates cauliflower and carrots into the white pasta. It has 32% of the daily recommended fibre intake per 85 g serving. It’s entirely likely that you’ve only ever had truffle at a restaurant because they are very expensive. Truffles are fungi that grow underground beneath the roots of trees. They are most prolific in Europe but there are some sightings in America. Legend says that pigs are the best for sniffing these delicacies. However, in Umbria we heard this truffle pig was nonsense because you’d never be able to get a truffle out of a pigs mouth even when trained. This is why they use dogs. We also heard to avoid truffle foraging tours in Italy. Tour guides usually plant the participants to spontaneously find. Truffle foraging is much more difficult. Truffles can be cultivated, but not easily. And so, truffles are reserved for special moments. 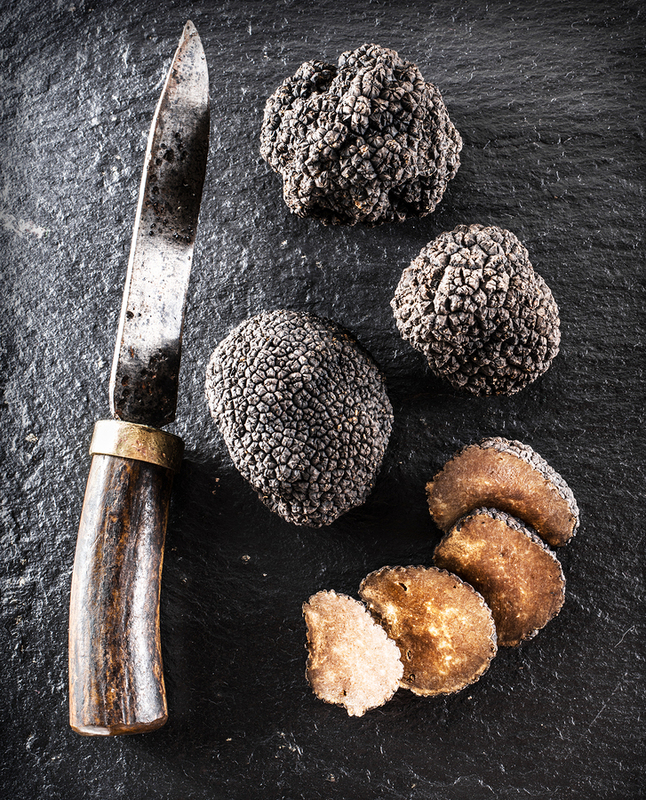 There are two kinds of black truffles, the Périgord truffle which grows in France and the summer black truffle found throughout Europe. Both are harvested in the autumn. White truffles grow throughout Italy, Croatia, France and Slovenia with the Italian Alba truffle considered as the best. 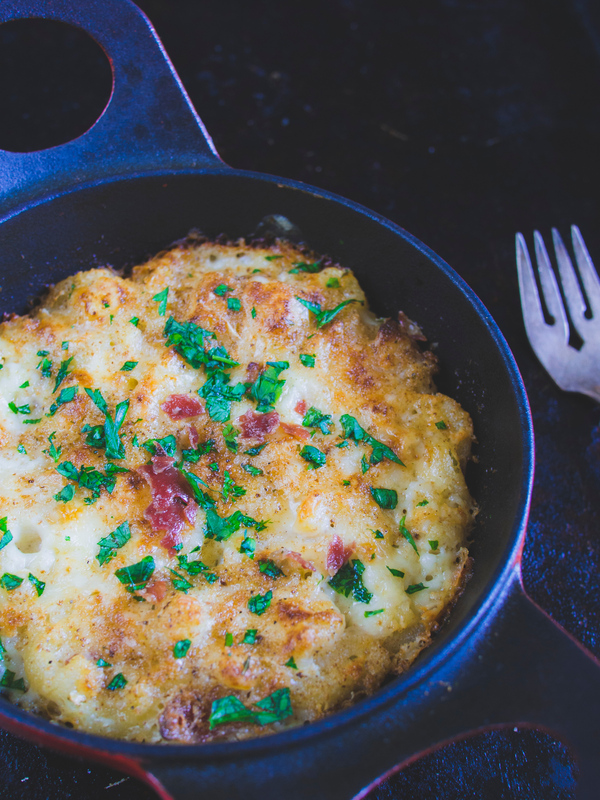 For this recipe, we’re using black truffle oil to stand up to the strong flavours of the cheese and pancetta. Black truffle oil is available in some supermarkets and specialty stores or also here on Amazon. If you can only find white truffle oil, feel free to substitute it as its garlicky pepper flavour is also fantastic in a mac and cheese. Over medium heat melt butter in a large sauce pan. Add onion and salt, sauté for 3 minutes. Sprinkle in flour, cook for three minutes. Do not allow flour to brown, so reduce heat if necessary, stirring constantly. Whisk in milk and cream for 2-3 minutes. Bring to a simmer, add bay leaf and nutmeg. Reduce heat to a low, gentle simmer for 30 minutes. Whisk occasionally so it does not scorch. Remove from heat. Add a pinch of salt and pepper. Strain mornay sauce into a new clean pot. Place over how heat. Add Comte cheese, stirring to melt. Fold in pancetta, cooked macaroni. Divide amongst 4 oven safe dishes. Top with remaining Comte cheese, bread crumbs. Bake at 400F until golden, about 25-30 minutes. Drizzle finished dish with black truffle oil. 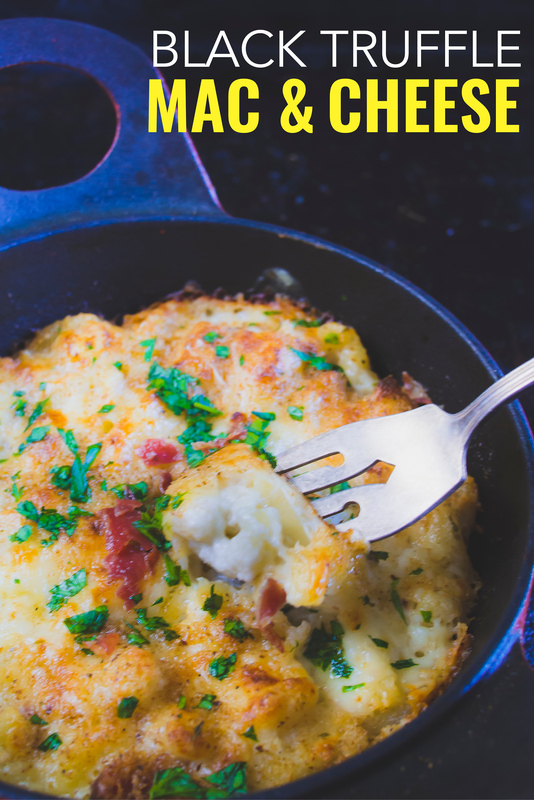 Chefs Tip: If the mornay sauce begins to scorch transfer to a new pan immediately but not do scrape the bottom. It’s important to add the truffle oil at the end and not in the cooking process as the heat will kill the fragrance and flavour. It’s an extra step but well worth it. Disclosure: This black truffle mac and cheese post is a paid partnership with Catelli Pasta. We are proud to be part of their #CatelliFamilies for a second year by sharing our favourite pasta recipes. You can find our recipes on the Catelli website here. This year Catelli turns 150 year old, along with Canada! We’ve contributed to a special collection of recipes with Canadian chefs and home cooks across the country. You can check the recipes out here. This looks so tasty!! I love truffles, but never buy them, I really need to treat myself lol Also what is pig butter??? Yes! Preach. Ever since I started blogging I’ve received gentle nudges to work in the “glamorous” restaurants, and have been trying to explain that it’s really not glamourous, but actually A LOT of hard work! Absolutely, it’s much more fun being a diner and enjoying the food than making it. PS pasta looks great too! I love that this adds some extra veggies in the meal! I’ll have to try them with my kiddos!! This recipe is EVERYTHING. Mac & cheese is literally my all time favorite comfort food. I need this in my life. Mac & Cheese, but with Truffles? This looks sublime, and your friends are so lucky that you are taking it a bit slower so that you can entertain. Amazing! This sounds so decadent! I wish I was eating it right now! I’ve been somewhat obsessed with truffle mac and cheese lately, it’s the absolute best treat after a long day. Can’t wait to try this version, I’m sure my friends would love it, too. This looks amazing! I have to try this ASAP! This would be great for all the holiday potlucks! You are right I’ve only ever eaten Truffles in restaurants. It’s so expensive to buy. 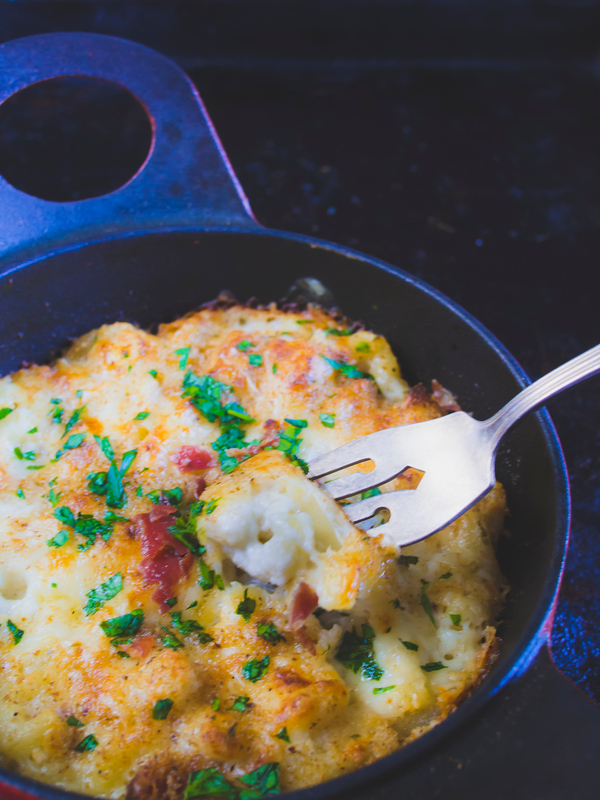 I love the idea of jazzing up a simple mac and cheese. Looks so yum.